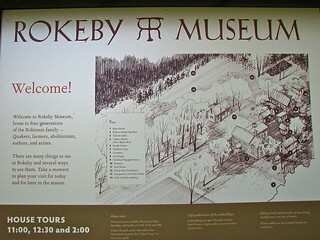 Ferrisburgh, Vermont USA • Rokeby Museum is one of the best-documented Underground Railroad sites in the country. Rowland Thomas and Rachel Gilpin Robinson were devout Quakers and radical abolitionists, and they harbored many fugitive slaves at their family home and farm during the decades of the 1830s and 1840s. Among the thousands of letters in the family's correspondence collection are several that mention fugitive slaves by name and in some detail. – From the Museum's website. ☞ This structure is listed on the Vermont State Register of Historic Places. Source: Data excerpts from "The Historic Architecture of Addison County: including a listing of the Vermont State Register of Historic Places"; Vermont Division of Historic Preservation; Curtis B. Johnson, Editor; © 1992. ☞ This District has been listed on the National Register of Historic Places (#74000201), since June 20, 1974. ☞ On December 9, 1997, the National Park Service designated this District as a National Historic Landmark (#74000201). National Historic Landmarks are nationally significant historic places designated by the Secretary of the Interior because they possess exceptional value or quality in illustrating or interpreting the heritage of the United States. Today, fewer than 2,500 historic places bear this national distinction. [ And only 17 in Vermont.] Working with citizens throughout the nation, the National Historic Landmarks Program draws upon the expertise of National Park Service staff who work to nominate new landmarks and provide assistance to existing landmarks. National Historic Landmarks are exceptional places. They form a common bond between all Americans. While there are many historic places across the nation, only a small number have meaning to all Americans--these we call our National Historic Landmarks. – From the National Park Service. ☞ Here's a link to an explorable GoogleMap with locations (and photos) of all seventeen sites in Vermont with National Historic Landmark Designations. ☞ More photos of this and other National Historical Landmarks.